This is Immanuel Kant, a philosopher. "In the chapter "Analytic of the Beautiful" of the Critique of Judgment, Kant states that beauty is not a property of an artwork or natural phenomenon, but is instead a consciousness of the pleasure which attends the 'free play' of the imagination and the understanding. Even though it appears that we are using reason to decide that which is beautiful, the judgment is not a cognitive judgment, "and is consequently not logical, but aesthetical" (§ 1). A pure judgement of taste is in fact subjective insofar as it refers to the emotional response of the subject and is based upon nothing but esteem for an object itself: it is a disinterested pleasure, and we feel that pure judgements of taste, i.e. judgements of beauty, lay claim to universal validity (§§20–22). It is important to note that this universal validity is not derived from a determinate concept of beauty but from common sense." 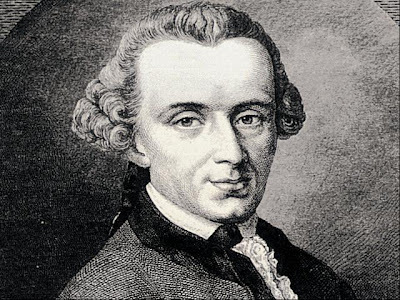 Kant describes the appreciation of an object or thing as a disinterested pleasure and that a thing can have a universal validity derived from 'common sense'. I think that this refers to a shared appreciation - a collective understanding of what is good and what is not. So whilst this notion of taste seems to oppose Bourdieu's - particularly the bit about having a 'disinterested pleasure' which would suggest that there are no social or political factors at play - no aspiration or desire to be perceived as more sophisticated or clever than you already are, there is the sense that the foundation for conformity and exclusivity - cementing class barriers through taste choices, is being laid here. "Kant pointed out in the middle of last century, what had not previously been discovered by mathematicians or physical astronomers, that the frictional resistance against tidal currents on the earth's surface must cause a diminution of the earth's rotational speed. This immense discovery in Natural Philosophy seems to have attracted little attention, indeed to have passed quite unnoticed, among mathematicians, and astronomers, and naturalists, until about 1840, when the doctrine of energy began to be taken to heart."